Another Election Day has come and gone, and the people of America have spoken. 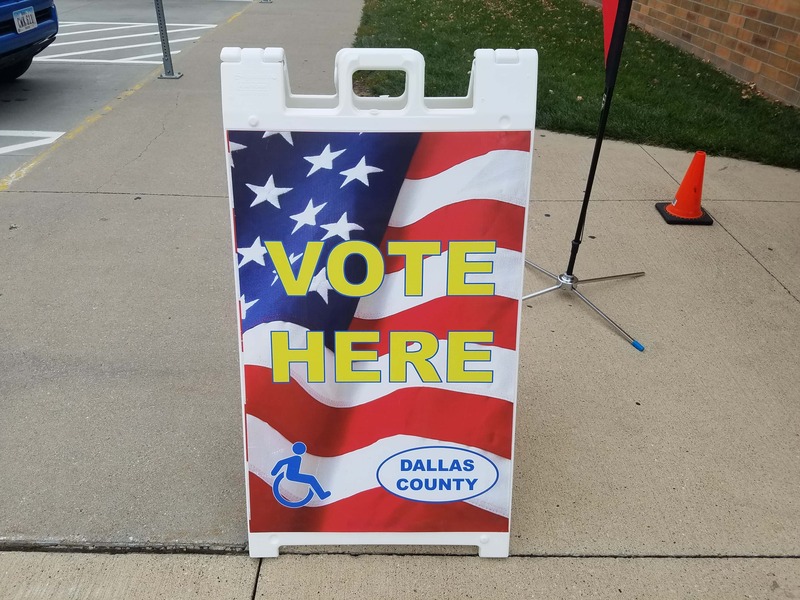 Dallas County had several races that kept the interest of residents, including for two of the three Board of Supervisors seats. However, the voters ultimately decided to keep the status quo on the Board. Republican incumbent Brad Golightly defeated Democratic challenger Breanna Morman for the District One seat, earning unofficially 55% of the votes. Meanwhile in District Three, Republican incumbent Kim Chapman emerged from a crowded ticket with 50% of the votes. Democrat Pat Stalter received 42%, and independents Michael Walrod and Robert Greenway took 6% and 2%, respectively. The incumbent held one other contested County race, as Republican Mitch Hambleton defeated Democrat Julie Stewart, receiving 55% of the vote to remain County Treasurer. County Recorder Chad Airhart, a Republican, ran unopposed and will retain his office. There was, however, one incumbent unseated last night. Incumbent Democrat Wayne Reisetter was defeated by Republican Chuck Sinnard in the race for County Attorney, with the challenger receiving 52% of the votes. In the state races, Democrat Warren Varley won the Dallas County race for Iowa House District 20 with 54% of the votes. That wasn’t enough to win the District, though, as Republican Ray “Bubba” Sorensen was victorious in the other three counties and won overall. In District 19, Republican Chris Hagenow won Dallas County with 56% of the votes, and also won the Polk County side of the District to take the seat. Dallas County also supported Republican David Young, the incumbent for U.S. Congress, District 3, though he was unseated by Democratic challenger Cindy Axne, according to CNN. Finally, the voters of Dallas County also elected to keep the judges up for retention, each by a comfortable margin. As a reminder, the results aren’t official until they’re canvassed at next week’s Board of Supervisors meeting.